I maintain my own hair. This includes, styling, shampooing, trimming, etc. I haven’t stepped into a salon in years. Although I’m tempted to go for a professional trim/assessment, but…procrastination and YouTube tutorials haha self-explanatory. Click here to see how I currently maintain my braids. Just recently, I decided to add an extra step in the process I take to get my extensions ready for installing braids. 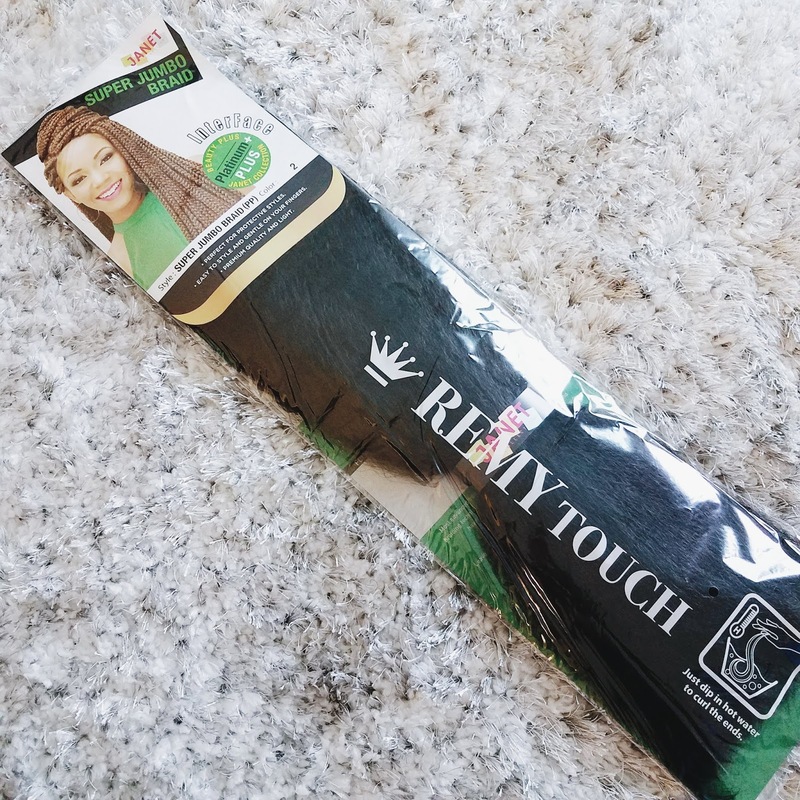 I currently use the popular kanekalon brand of braid extensions. They are inexpensive. I need this especially since I change my style frequently in a year (that bill adds up!). 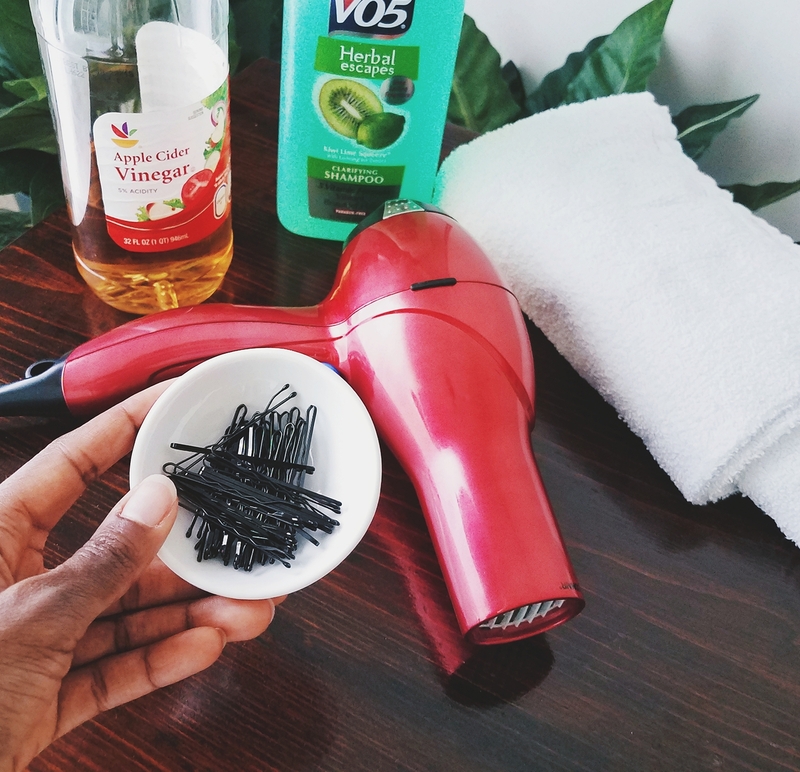 I use them for quick styles like box-braids, regular braids, etc. These extensions are easy to shop for and I get exactly what I need. With that said, I’m giving myself a “Gold Star” for simplifying my life in this way lol. I recommend embarking on this preparation technique 1 to 2 weeks before actually braiding your hair because of step #5. I open the first bundle of hair from its plastic packaging (Tip: DO NOT cut the rubber band tied around the bundle) and I soak it in a shallow bucket of water. I use the rubber band that comes with the bundle to hold the hair while I wash it. I add some Clarifying shampoo and run/spread it top to bottom (repeat). Never in a back and forth motion. You want to limit the amount of knots in the hair. I lather it up and keep running my fingers through it as I wash the bundle of hair. Next, I quickly soak/rinse out the shampoo in the bucket of water I have. 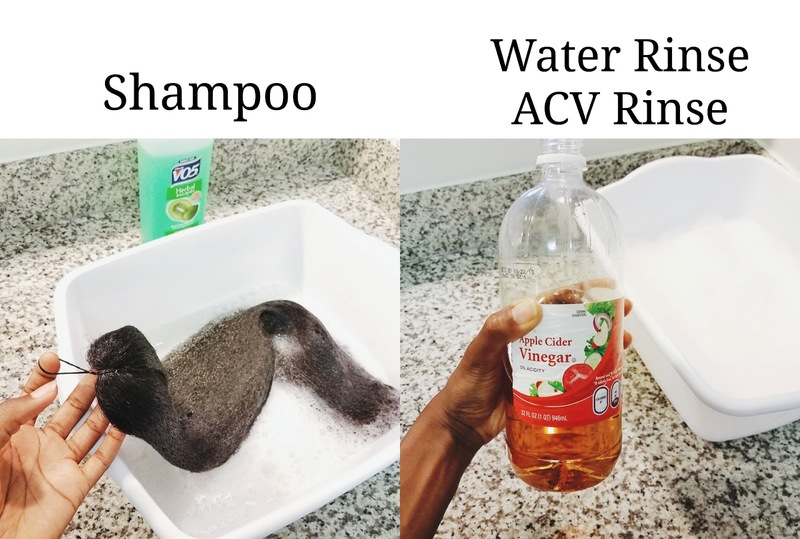 Here, I rinse the bundle of hair again with a diluted bottle of ACV. In the purchased bottle of ACV (or a separate bottle, your choice) I create a mixture of half water, half ACV (or 1-part water; 1-part ACV). Then I just lightly rinse out some of the ACV in some water. 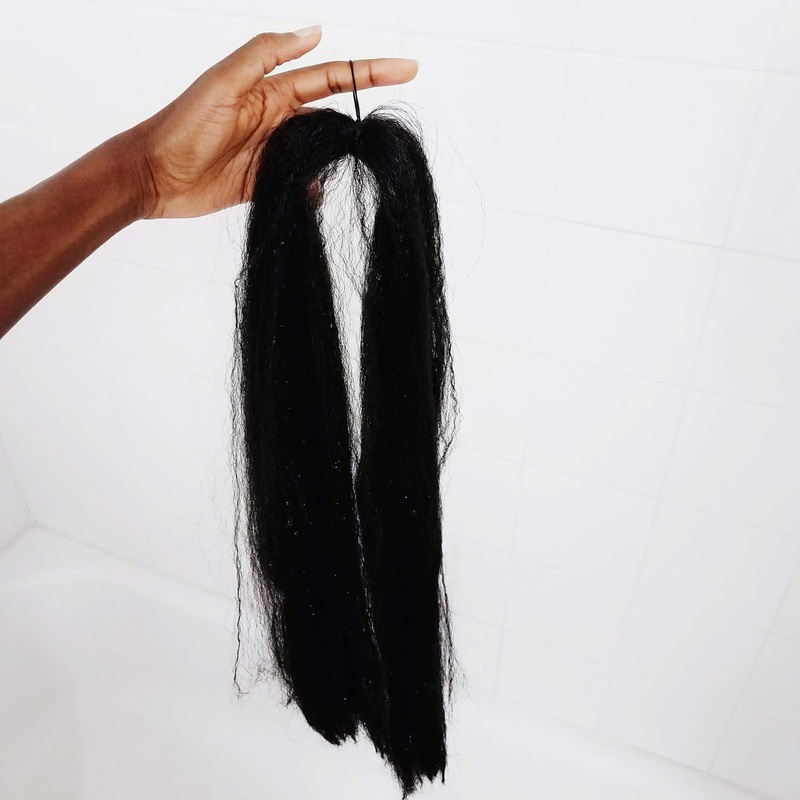 If I’m prepping only HOURS before I need to put in my new braids, I use a blow dryer to completely dry the extension bundle after shaking out the excess water. Otherwise you can just hang the bundle on a plastic clothing hanger in the shower and let it air-dry. Step #5: If you’re doing this 1-2 weeks or so before you actually braid your hair, then you’ll have time for this step. I discovered that it would be MUCH EASIER if I sectioned off the extension pieces BEFORE I start braiding so that I can just pick one section and start braiding immediately, instead of wasting time parting and preparing the hair, if that makes sense. 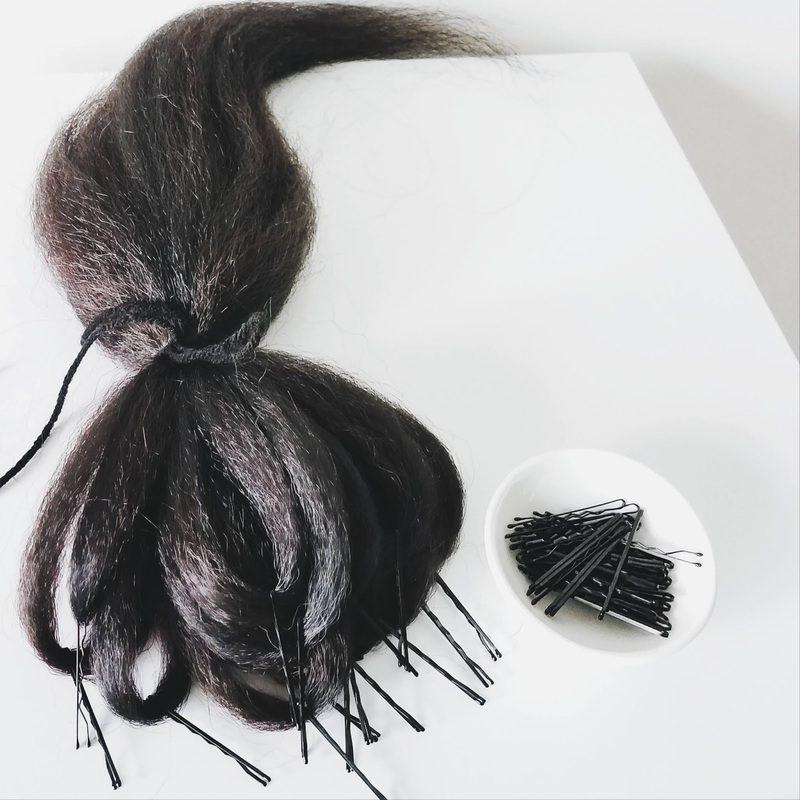 What I do is section off the hair to the thickness I want and then clip it in a bobby pin then secure it (in a new bundle) in a plastic bag (or your preference!) until I’m ready to braid my hair. I bought a lot of bobby pins but that’s a small price to pay for my time in the long run! It works marvelously. I was less tired and stressed and I finished in record time. I don’t know if you've tried this out or not but I know I’m probably not the only one discovering this piece of genius haha If you have tried it, then let me know if it's ideal or not!